To celebrate the first weekend of Halloween Time at Disneyland, my family and I had a staycation at Howard Johnson Anaheim, so that we can enjoy two full days of Disneyland Halloween Time fun! We explored all the fun things Halloween Time has to offer toddlers at the Parks! Halloween Time at Disneyland offers a HUGE array of snack offerings this year (the complete foodie guide is on Disney Parks Blog). I wanted to give a shoutout to a couple of my favorites! The Coco cake and conchita at Paradise Garden Grill in Disney California Adventure Park are absolutely incredible! The cake is has churro mousse inside, and is honestly one of the best cakes I’ve ever had. And of course, popcorn is a classic go-to snack during Halloween Time. I particularly love the Halloween Time popcorn bucket this year for $6.75. Over by Paradise Garden Grill, they have a craft station for kids where you can color a Dante or Pepita mask! (It’s been a week since we made ours and my daughter is still playing with hers). Near the craft stations, they have the most adorable photo ops! They have a Pepita wing wall for adults, and a Dante wing wall for kids. The Halloween Time merch is so adorable! 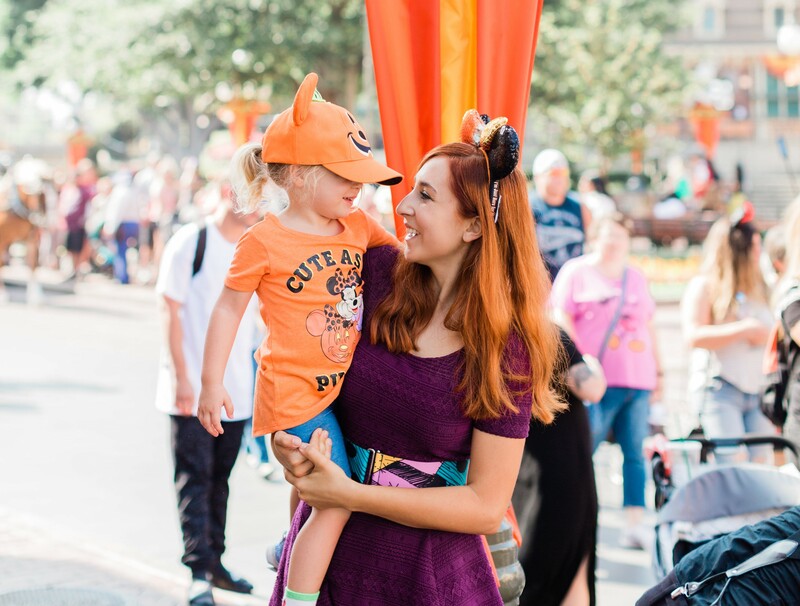 My daughter is a big fan of the light-up pumpkin necklaces, the Fab Five dolls dressed for Halloween, and our two favorites, the Mickey pumpkin hat for kids that says “Hey Pumpkin!” on the back, and the candy corn Minnie Mouse ears! Another merch favorite for Disneyland Halloween Time this year? The new Disney Villain balloons they sell on Main Street! My toddler loves anything Halloween-related so went nuts over these balloons! And of course a classic favorite character meet-and-greet during Halloween Time are the classic characters dressed up for Halloween (Mickey, Minnie, Donald, Goofy, and Chip & Dale)! My daughter absolutely adored Minnie’s witch costume, and Minnie loved that she was on my daughter’s shirt! Although Haunted Mansion Holiday is there every year, it has to go on the top of this Disneyland Halloween Time with Toddlers round-up! It’s just a classic that never fails to please. My daughter year round is always asking if Haunted Mansion is “Spooky Christmas” yet. We went on Haunted Mansion Holiday first thing, and was the only ride we went on for the first two days of Halloween Time since she had been anticipating it for so long! We rode it 5 times! Halloween Time is an absolute blast with the family! It’s currently happening now at Disneyland Resort until October 31st. To learn about some of the travel and park deals currently happening during Halloween time, click here. The Ultimate Solo Movie Night!